Knit construction, round neck, toggle closure. 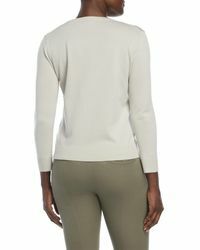 Three-quarter length sleeves, ribbed trim. 70% Rayon 30% Nylon. Hand wash cold, dry flat. Ladies. True to size. Model shown is 5'11" and is wearing a size small.